The variation in the colors of skin in the human race is mainly due to genetics. The skin color is determined by the amount of melanin present in the skin cells. Can we classify skin by color? The most popular scale for the classification of skin color is the Fitzpatrick classification which classifies the skin color into sic types from I-VI, where I is the lightest and VI the darkest skin color. This classification is dependent upon the time a particular skin takes to tan. Pigmentation can be of different kinds epidermal or dermal. The epidermal pigmentations are superficial pigmentations which are due to increase in the melanin content in the epidermal cells or Keratinocytes. The dermal pigmentation is deeper and more difficult to treat. Treatment of epidermal pigmentation is achievable in fewer sessions than the dermal ones. Also, the dermal pigments are more recalcitrant than the epidermal ones. The brown spots that occur on the different parts of the body and mainly the face may occur as patches or singly. They can have various causative factors. Why do I have these brown spots or patches? The causative factors of the pigmentations can be many. Most common of them are Sun damage, inflammation, injuries, post-surgical, pregnancy or hormone-induced pigmentations like melasma, heredity, continued friction by rubbing, Nevus of ITO or OTA which are present by birth. Many endocrine diseases like Addison’s disease cause an overproduction of melanin and cause hyperpigmentation disorders. What is the pigment in hyperpigmentation? The pigment present in hyperpigmentation is melanin. This is synthesized in melanocytes and is packaged into melanosomes and distributed in the skin cells called keratinocytes. The melanin production is governed by a variety of factors and enzymes. Exposure to the sun increases the production of this pigment by the cells. Thus, to control hyperpigmentations the melanin synthesis or directly melanin has to be targeted. A targeted therapy is always better for hyperpigmentation control. What are the different types of pigmentations? The different types of hyperpigmentation are Lentigo Solaris or lentigines or freckles, Melasma or chloasma, Post inflammatory hyperpigmentation, nevus of OTA or ITO and periorbital hyperpigmentation (dark circles). Actinic keratosis are age-related scaly spots that occur in the skin after 40 yrs of age and they can be present on the face, neck, hands, back and other sun-exposed parts of the body. Can my spot be cancer? The hyperpigmented patches are not cancerous in most conditions. People who are prone to developing actinic keratosis may be followed up closely for changes in the skin to detect any odd behavior in the pigmented scaly patches. How can I prevent my brown patches and spots? The brown patches or spots are not always preventable. Since sun exposure is one of the major causes of pigmentary conditions, it can be somewhat decreased in intensity by regular use of sunscreen and avoidance of sun in the hottest times of the day. In a tropical country like India, a sunscreen which is 30 SPF or above must be applied in the daytime and repeated every 2-3 hrs to maintain the sun protection. Physical barriers to the sun like hats, caps, umbrellas or covering a particular part of the skin also helps. How can I get my hyperpigmentation treated? One can get examined by an expert who has been dealing in treating hyperpigmentation. As a Cosmetic Surgeon, I see a whole range of hyperpigmentations. The post-surgical or post-procedural ones eventually settle with time but for others, we can offer a variety of treatment like topical applications which are hydroquinone based or retinoid based. 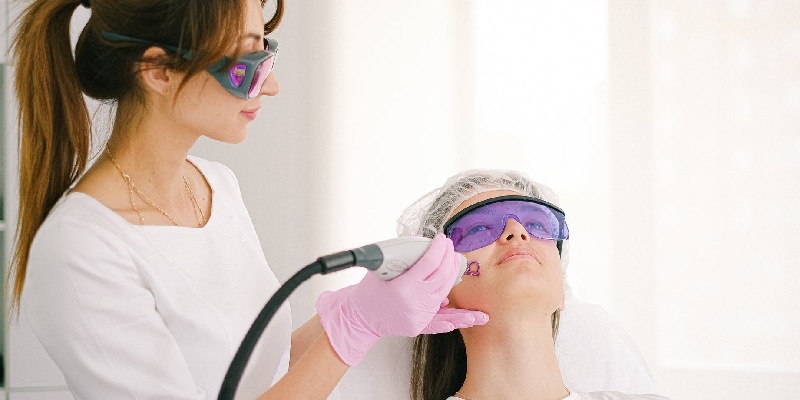 Even if total clearance is not achieved it can be considerably lightened over time with the range of treatments that we have like lasers, peels and other in-clinic treatments. Lasers help in treating the hyperpigmentations by targeted therapy against the melanin that is the cause of hyperpigmentation. The melanin is ‘micro-blasted’ and eventual lightening and clearance occur over a few sessions. We use USFDA approved Q-switched laser to treat our patients and have encouraging results across all hyperpigmentations. The theory of ‘selective photothermolysis’ targets only the melanin cells without causing damage to surrounding tissues. The pigmentary disorders are a cause of considerable psychological stress and treatments often meet with frustration. A combined therapy approach is often the best solution along with the disciplined use of sunscreen which is often ignored in the Indian population. We recommend higher protections after procedures and combination treatments are available which are multi-pronged to treat hyperpigmentation.